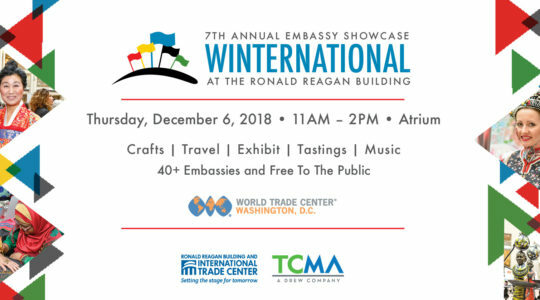 Winternational is an exciting celebration showcasing the cultural and culinary traditions of Washington’s diplomatic community. This festival has the atmosphere of a bustling global marketplace with each embassy promoting their country through vibrant displays of visual art, food, handcrafts as well as travel and tourism exhibits. Free and open to the public, guests have the opportunity to travel the world and do some holiday shopping — all during the lunch hour! Are you interested in volunteering with the embassies? Email us for more information about available opportunities! Missed out on the 2017 Embassy Showcase? Check out The Washington Diplomat‘s event recap, here.